VideoIQ have claimed they have a unique product that can fulfil a niche in the IP video marketplace that as yet no one else has attempted. In effect they have managed to create analytics on a megapixel camera and use edge technology to achieve a simply better surveillance solution. A bold claim, but does it work and can the new technology really live up to the claim? As part of the day job we got VideoIQ to do us a demonstration. What was seen was an impressive product with some pretty impressive features. Firstly unlike most other IP video solutions there is no requirement for a NVR. The VideoIQ iCVR camera looks a pretty robust unit and all the recording is done at the edge of the network. This means that it’s a scaleable approach to recording. If you need just one camera then that’s all you buy, no need to buy expensive recording equipment that is under used, equally no need to upgrade each time you want to increase security across your company or group. Because all the recordings are stored on the edge of the network, the iCVR camera only needs to stream what is requested or deemed an alarm event. The streamed video can be set up by the use of rules and this means that only minimal bandwidth is ever required, essentially by-passing the most expensive part of a new IP CCTV installation i.e the cabling infrastructure. So have VideoIQ really achieved effective analytics with a megapixel camera? Yes is the answer, once installed the advanced analytics calibrate themselves. The self learning technology was demonstrated and the iCVR camera seems to get more intelligent with each object detected. The whole point of this technology is no wasted network capacity but still be able to achieve excellent image quality. Alarms can be generated via email and advanced search facilities mean that objects can be easily tracked and zoomed into. With browser access, viewing is possible from any PC and an event driven alarm review screen incorporated into the VideoIQ view software makes operation easy. The software is included with the purchase of the camera. VideoIQ claim the iCVR is a fully integrated solution, we tend agree. 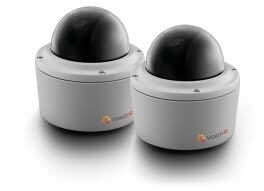 The package includes the iCVR camera, the embedded DVR, powerful analytics and the video management software. A complete solution? Well there are those I’am sure who will dispute that, but from what we witnessed it goes a very long way towards one. This entry was posted on Wednesday, August 31st, 2011 at 18:15	and is filed under IP cameras, IP CCTV. You can follow any responses to this entry through the RSS 2.0 feed. Both comments and pings are currently closed.